HONOLULU, Hawaii, January 12, 2012 (ENS) – Hawaiian and national environmental groups are joining the Hawaii Department of Land and Natural Resources to combat poaching and wildlife crimes by sponsoring a toll-free, confidential reward tip line, 1-855-DLNR-TIP. Members of the public can use the new statewide tip line to confidentially report information about poaching crimes to law enforcement officials. The Humane Society of the United States and The Humane Society Wildlife Land Trust will offer $2,500 rewards for information leading to the arrest and conviction of the person(s) responsible for specific, predetermined cases. In addition, the Conservation Council for Hawaii, the Center for Biological Diversity and the Marine Conservation Institute are collectively offering a reward of $2,500 for each incident. An anonymous local donor has offered to match these rewards, bringing the reward total up to $10,000 per animal. 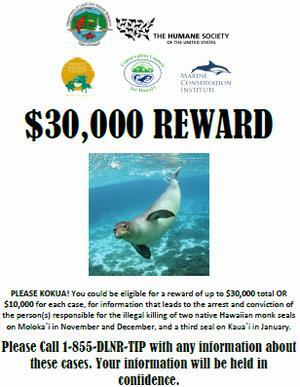 The first case under this new reward program and tip line involves three monk seals killed on Molokai and a fourth monk seal found killed on Kauai earlier this month. Two of the monk seals were found beaten to death on a remote coast of Molokai, one in mid-November and the other just before Christmas. A third dead seal found on Molokai could also have been intentionally killed, state wildlife officials believe. Necropsies performed on three of the four seals confirmed the “suspicious” nature of the deaths, according to wildlife officials. The fourth case is pending additional information. Anyone with information about these cases is asked to call the confidential reward tip line. The reward total for information leading to the arrest and conviction of those responsible for the deaths of the three seals known to have been killed intentionally could reach $30,000. Classed as Critically Endangered, Hawaiian monk seals are one of the world’s rarest marine mammals, with the population estimated at less than 1,100. 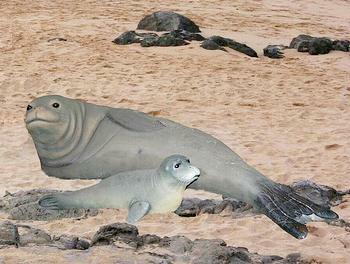 Hawaiian monk seals are endemic to Hawaii and found nowhere else in the world. No one knows why the seals were killed, but the deaths occurred at the same time as the spread of an untrue rumor that monks seals are not native to Hawaii and don’t belong in the state. “It’s really serious. This attitude, this negative attitude toward the seals has overpowered the concern that this is a species that’s going to become extinct,” Walter Ritte, a Molokai resident and environmental activist told the Associated Press earlier this month. Hunted to the brink of extinction in the late 19th century, Hawaiian monk seal populations have been declining over the past several decades due to human interactions such as intentional killing, marine debris and fishing gear entanglement, disease and loss of habitat. In June 2010, the Hawaii State Legislature passed a law to increase penalties for harassing or killing a monk seal to up to five years imprisonment and a maximum fine of $50,000. Monk seals are also protected under the federal Endangered Species Act and Marine Mammal Protection Act, which makes it a crime to kill or harm a Hawaiian monk seal. “We thank The Humane Society of the United States for their sponsorship of this new program to help protect Hawaii’s precious wildlife,” said Randy Awo, who heads the DLNR’s Division of Conservation and Resource Enforcement, DOCARE.